We currently have some BIG boys at PSGR waiting to find their forever homes. Upon walking into the main herd, their presence is unmistakable. They are all about 2 times the size of anyone else in the herd. One would think these boys are the leaders of the pack when in fact the opposite is true. Romeo and Maverick came to us via a private party surrender. Each about a year and a half old, they had been left as bucks until just days before arriving at PSGR. They are two of the most handsome goats I have ever seen. Long hair, beards and the best top knot hairdos! As big and masculine as they were in appearance, it was clear from the start that these boys were the sensitive and quiet type. Still to this day, months later, I don't think I've ever heard either of them bleat. Not once. A few weeks after they arrived it was time to integrate them into the main herd. To our surprise when we did there was none of the usual introduction antics. No head butting, no running around, no exploring. The two simply made their way to a side pasture and there they stayed. For weeks. Only coming down to eat after the main herd had settled in for the night. And then they discovered the tree trunk. For a month, the two boys took turns with their heads in the trunk. They would stand there for hours at a time. We did everything we could to ease their stress but they apparently found solace in the tree trunk so we let them do what they needed to do. After weeks of this odd behavior their stress began to dissipate and they slowly started integrating themselves into the herd. Romeo finally came out of his shell and showed off his moves. He loves to jump and dance in the air, his long hair flowing like a super model. Maverick loves to give kisses. He has the sweetest face and loves his cheeks scratched. He is often like a little kid hiding behind me when anyone he doesn't know comes to visit but he is beginning to realize that Barbara and I aren't the only ones who will give him love. These two are true sweethearts, so gentle and kind. Despite their size, they aren't demanding, it's almost as if they come up to you and ask permission to get attention. They never assert any dominance, but they often secure their favorite spot atop the picnic table (Romeo) or on any hill (Maverick). The recent addition of Groot makes Romeo and Maverick not seem so big. Which seems impossible but Groot is a big, big boy. He lived 3 years on a tether before being surrendered to us. When we picked him up, he ran right up to me and wanted to play. This coupled with his size, made me look at Barbara and say "well this is going to be fun" but by the time we arrived back at the rescue, he was shaking like a leaf. He, like the other big boys, is sensitive and incredibly gentle and sweet. He loves to great visitors, especially the smallest ones, he is fascinated by them. Romeo, Maverick and Groot are respectful, loving and quiet; the definition of gentle giants in my book. Their stories have only just begun. We've loved being a part of their journey thus far. In our chapter, we're tasked with making sure these big, sensitive boys feel as loved and secure as possible until we find them their lifelong home. We can't wait to see what the next chapter holds for our gentle giants. And everywhere that Tillie went the lamb was sure to go..... Tillie and Buckaroo were both rescued from a local slaughterhouse this past Fall, just days after they each were born. Today, they're the best of friends. Buckaroo follows Tillie everywhere on her adventures around the farm. Their paths to the happy duo they are today could not have been more different. I've talked in past posts about what an uphill battle saving young rescues born at the slaughterhouse is. Tillie was an exception. Knock on wood, this little boer cross doeling has not been sick a day in her life. She arrived healthy and vibrant and has not slowed down one bit. She is full of personality and character and has no fear. She will challenge any goat on the farm and will take off exploring with out a second thought. And her ears, she has those helicopter ears we all love so much! Buckaroo on the other hand was the definition of the all too common uphill battle. He arrived caked in mud, weak, lifeless and with no interest in taking a bottle. He championed through his first few days but was not quite the vigorous and energetic lamb he should have been. Weeks went by where he would have good days and bad and we honestly weren't sure what the future held for him. Luckily the wonderful Dr. Pete thought an ulcer might be causing his problems. Sure enough, within a day of treating it as such, he was a new lamb. He is gaining weight, growing like a weed and bouncing around after Tillie wherever she goes. 2 different roads led to where they are today, a darling duo who is as entertaining as they are cute. They will get to live out their lives as the best friends they have become. A story that nursery rhymes are made of. We have no idea how long he had been wandering without a home, where he came from or what led him to where he was found. A few years ago Wally showed up at an alpaca farm in Maple Valley. He was just standing in one of their pastures one morning. They called the rescue and Wally was picked up and brought to PSGR. He was frightened, thin and very leery of human contact. Over time we have earned a little bit of his trust. He will now approach us when we enter the pasture and he will now eat out of our hands. He is a goofy goat. Tall, lanky and slim by nature, with a big head and little ears. He is very athletic; quick and agile, he reminds us of a deer. It's impossible not to smile every time you see this quirky looking guy. 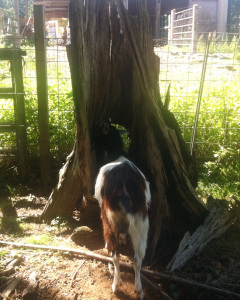 Around the same time Wally arrived we also took in Claudine, a goat seized by animal control from a cruelty case. Claudine was terrified, traumatized and clearly had not known a gentle touch. She was being kept alone in an open pasture with no shelter in the dead of winter. Her hooves were so overgrown she had to crawl to get anywhere. Animal control confiscated her on the spot and brought her to the rescue. She still struggles with hoof problems that require regular trims and having her feet treated regularly with a spray. This has made her a little more hesitant in warming up to us. Honestly, who could blame her when she associates us with uncomfortable hoof treatments? Little steps of progress are made though. Once she realizes you are not there to hurt her, she will stand still and let you approach and pet her. It is easy to tell she is an incredibly sweet natured goat. Currently they are the longest adoptable residents at the rescue, 3+ years. The two have been residing at a foster home just down the road from PSGR. Ironically, it is also home to a herd of alpacas. Wally seems to have a thing for alpacas. Wally and Claudine are truly the best of friends and have an incredibly strong bond. They may not be like our other rescues who thrive on human interaction and love attention and affection but Wally will run up to greet you when you visit. Claudine is always not far behind him. Taking animals into our rescue comes with a promise from us to them. That we will do everything we can to make sure they are loved and respected for the rest of their lives. That they will never be hungry or without a drink of water again and that we will work to find them their forever home. Wally and Claudine are in need of just that, a forever home. A home that understands that they are shy but that they want to trust and with patience and TLC, they will. A home that recognizes Claudine's need for extra care for her feet. The rescue is a less than ideal place for Claudine and her feet in the winter so we would like nothing more than to find them a new home as soon as possible. We know Wally and Claudine would like that too. Help us fulfill the promise of rescue work and complete the circle with a forever home for Wally and Claudine. After what they have endured, they deserve to finally be home. For those of you who follow our Facebook page, you're probably familiar with Daisy. Daisy is known for having the best ears on the farm. Her ears often stick straight out to the side and she looks like she's about to take off, helicopter ears we often call them. But there is so much more to this darling little girl who is still, 5 months after her rescue, waiting for her forever home. Daisy was rescued from a local slaughterhouse when she was just a few months old. She was rescued with 3 adults and at the time we had no other kids her age at the rescue. Daisy didn't seem to mind, she fit right in with the big goats. Daisy was friendly but a little leery of her new situation at first and who could blame her? She quickly realized she was now somewhere she would be respected and would get all the love and attention she could ever want. And we quickly learned, she can't get enough! 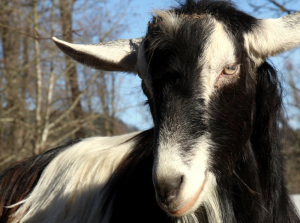 Daisy has truly turned out to be one of the sweetest, most affectionate goats on the farm. She will seek you out and if you don't notice her, she will gently paw you to let you know she is there and would like some attention. She would stand with you all day and let you pet her and she will follow a brush anywhere. She is incredibly easy going, tolerant and she gets along with everyone. She'll stand patiently while you trim her toenails or wear various holiday headbands for photos. She's mindful and polite, never pushy, never noisy. She is simply, delightful. However this precious little girl is still waiting to find her lifelong home. The time it takes for goats to be adopted once they're ready to be, varies. Part of the work we do is making sure that we are facilitating the process of finding the best "fit" for both the goat and the adopting family. Yes, the more animals we adopt out the more we can rescue, but making sure it is a positive and lasting relationship for the animals and their new families is just as important. We know that the perfect forever home for Daisy is out there. When the day comes that she leaves us for it, she will be greatly missed but she will have found what she deserves, a family of her own to love her forever. Trust us, she will return every ounce of that love, ten fold. Everyone has their favorites. I catch myself every time I want to say "favorites" when I talk about the animals that cross our path. I guess I just feel bad, I do love them all but there are some that cement a special place in my heart. So ok, yes, favorites. Everyone has their favorites. For me, there are "my boys", Finn, Rocket and Loki. Now a little Nubian kid we named Chance has joined their ranks. The minute I opened the back of the truck when volunteer Janice arrived with the latest group of slaughterhouse rescues last month, my eyes went right to a little Nubian kid laying almost flat out in the back of the group. Instantly my heart melted. I asked Janice if he was ok. He certainly didn't look ok. She had picked him up off a kill pen floor and wasn't sure just what state of health he was in but he wasn't going to die there, that she knew. We started unloading goats one by one. Once the truck was almost unloaded the little Nubian finally got up and cried out. Immediate relief. I carried him to some grass where he instantly started eating. Chance was most likely a bottle baby. He was purchased by the slaughterhouse from a local livestock auction. The auction and slaughterhouse experience can be hard on even the most resilient animal. For these young little ones, going there can be simply devastating to them. They aren't usually handled with care or respect there and once at the slaughterhouse they can't compete with the bigger animals for the limited food and water. They are often confused and scared. Chance was clearly overwhelmed by everything he had been through and exhausted. When I finally sat down that evening he came up to me, laid his head against my shoulder and fell asleep. I was in love. I like to think the feeling is mutual. He follows me everywhere when I'm at the farm. I look down and he's always just staring up at me and he always has something to say. Always. He often talks without really opening his mouth, it is the most endearing, sweet voice. And his eyes, he has these sleepy eyes that make me melt every time I look at him. He loves Emma and Enzo, two Nubian kids he was rescued with. They likely found eachother at the slaughterhouse and banded together, they're rarely ever apart these days. In them he has a newfound family allowing him to feel safe and at ease. These three have not stopped eating since they arrived. They're gaining weight, growing and couldn't be doing better! Sweet little Chance bears the name of the opportunity we are able to give all of the animals at PSGR, a second chance. This summer we've rescued dozens of does from a local slaughterhouse. The question we ask as we check each one in is always "Is she pregnant?" Well this summer we learned we're not so good at the guessing game. There were a number of does we thought were likely pregnant only to have pregnancy tests come back negative. Barbara even had to ask the lab "Are you sure?" Last week much to our surprise one test came back positive! The surprising part was not that one is pregnant, in fact, we were surprised that more aren't expecting. There is no separation of does from bucks at the slaughterhouse. They're all thrown into pens together to fend for themselves. If the doe goes into heat, they're likely to be bred. So we wait 30 days from their arrival and test to see if in fact we've rescued more that just one. Our surprise came when we learned that the expectant mother is Amelia, a skinny young Alpine cross that was rescued in July. Amelia is a real sweetheart, bright eyed and full of energy. Of all the does, she was one we least expected to have little ones on the way. So what do we expect when we're expecting? A lot of waiting. If she was bred at the slaughterhouse, she'll kid around Christmas. Since we have no idea if she was bred there or before she was sent to auction, it could be anytime between now and then. She's receiving lots of extra groceries to help her gain weight and nourish the growing baby (or babies). We'll keep a close eye on her for signs that she could be getting close to kidding, at which time she'll move into a maternity part of the barn. The baby monitors get turned on every night and we continue to wait. The other surprise in store....we have no idea what breed the buck was. More unknowns. What we do know though, is Amelia's little ones will never know the carelessness and fear their mother has experienced. They will know comfort and security and a lot of love from the minute they arrive in the world. They will get to live out their lives together, as a family, safe and cared for. Congratulations Amelia, we can't wait to meet your little family! "I cling to my imperfection, as the very essence of my being" ~Anatole France Last weekend I arrived at the rescue, sat down to put on my boots and within minutes Rocket was in my lap. He immediately started chewing his cud and enjoying a lazy Sunday morning. The funny part about this is that Rocket, long ago, passed lap goat size. But he doesn't know that. Nor does he care, I don't mind either. There is nothing quite like the unconditional love this guy exudes. Rocket arrived as a breeder cull earlier this year. He is strikingly gorgeous. He was culled because of a imperfect teat. The farm Rocket was born on breeds for show and any imperfection is removed from the reproductive herd. When he arrived at 6 weeks old he was quite a bit bigger than the other kids at the rescue so he went to a foster home where they had some kids his size to play with. He came back a few months later and the more time I spent with him the more fond of him I became. He has a quiet, respectful presence but he is always near by. When all the kids descend on a pile of fresh cut browse, he doesn't go in with the crowd. He'd rather hang out with his people and nibble on what is left over later. He adores people and loves soaking up every bit of attention he can get. Every time I leave, he walks me to the gate. I like to think it's his way of thanking me for our time together that day. His story is not one of being saved from death row at the slaughterhouse or being rescued from heartbreaking neglect. He has known nothing but compassion and comfort since he was born. PSGR provided him a place to call home so he wasn't sent to auction. So he wasn't purchased for slaughter for a small imperfection of his anatomy. We provide a safe, loving place for these breeder culls to go, we find them their lifelong homes. By doing so, one by one, little by little, we show the world, there is another way. 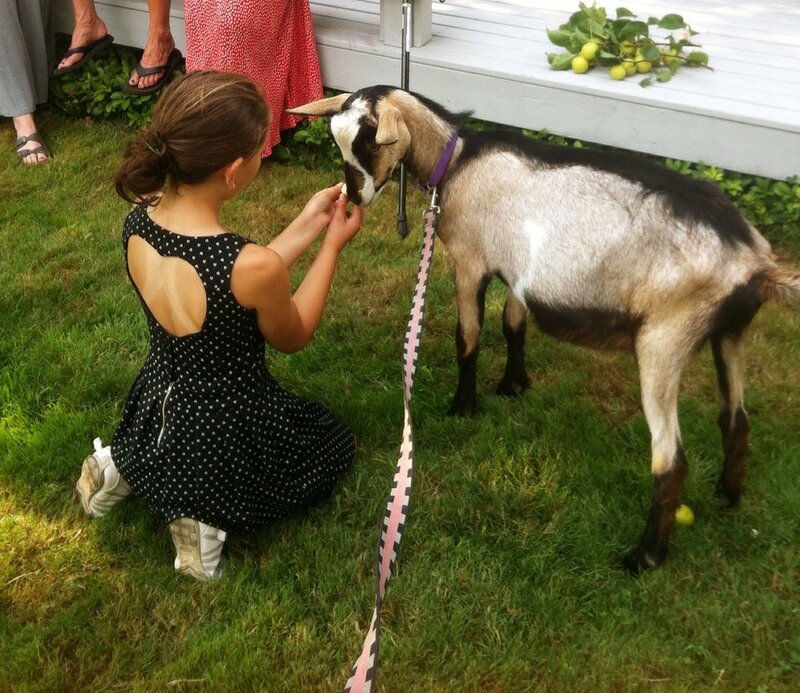 I often refer to Rocket as our "ambassador" goat. He lives up to this every single day. His carefree, tender spirit enriches the lives of all of us who get to share his life with him. To us, he is perfect. Cinderella...Snow White...we all know fairytales end with happily ever after. Despite the mean step mom, despite the poison apple, we rest assured that there's a happy ending ahead. When Talia was rescued from a local slaughterhouse, she was one of the thinnest goats Barbara said she has ever seen alive. The mere sight of her broke our hearts. We had hoped that with an endless amount of good food, Talia had a happily ever after waiting for her. However, her road had a few more twists and turns than we expected. Temporary blindness, due to a form of pink eye goats are exposed to at the slaughterhouse, was her first hurdle. She had suffered through the stress of an auction and a slaughterhouse and this only added to her stress. She would barely eat unless someone was standing there with her. The minute we walked away she would stop eating. Barbara spent countless hours cutting and holding blackberries for her. Volunteer Shawna spent evenings guiding her around to fresh grass and browse. A lot of hours were spent just standing with Talia while she ate. But temporary loss of sight became the least of her problems. Her digestive system wasn't working the way it should. Despite trying everything we could think of, we could not get her on track for any length of time. No matter what she ate or how much, she couldn't keep the weight she desperately needed on. Vets ran a variety of tests checking for a number of different diseases, parasites, etc. Looking for any answers that would explain what was going on. All the tests came back inconclusive. We were frustrated and disappointed that we couldn't find the answers to help her. But in rescue work you don't give up. No matter how discouraged we become, we keep trying. It's just what we do. She developed a love of canned pumpkin sandwiches. We continued with various supplements and hay and fresh browse. She stayed in her familiar quarantine area while she slowly regained her sight. 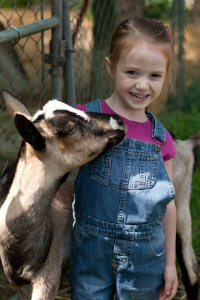 Callie, a little Nigerian Dwarf who had been rescued around the same time, would make her way down to the barn where Talia was every night to be let in to spend the night with her friend. Talia finally regained her sight and started to eat, unaccompanied. She seemed to be headed in the right direction. We let her join the main herd, she thrived being with them only to relapse again a few weeks later. In that moment, as in so many the weeks before, we were unsure of what her future held. But as I've learned from many before her, Talia reminded me that these animals that have endured so much, can be amazingly resilient. She bounced right back from that relapse and has been improving ever since. She's always at the gate watching people move about the farm, waiting for someone to slip her a treat. She's never more than a few feet away from me when I'm out with the main herd. More often she's standing directly on the pile that I've just swept up. The best thing is, she is gaining weight and keeping it on. She's ready to find her forever home. The minute we posted a video and pictures of lambs Bongo and Halle, our newest arrivals, we knew people would be fawning over them. They're simply adorable. They had been with us almost 2 weeks before we unleashed their cuteness on the world. They had a tough go....and we're still a little cautiously optimistic with their health but their story gives you a look behind the barn doors of what often goes into saving the youngest rescues. Bongo and Halle didn't arrive as the happy, energetic lambs they are now. They were found by workers at a local slaughterhouse in a trailer that had been unloaded of sheep for slaughter the day before. The odds were stacked against them from the get go. Less than 24 hours old, born in a dirty trailer packed with sheep, it was unlikely they got to nurse off their mom so chances are they didn't receive any colostrum. Colostrum is essential for newborns in their first few hours, without it, they lack needed antibodies. The survival rate of lambs and goat kids is slim without colostrum and we missed the window to give them any sort of supplement. This is often the case for little ones born at the slaughterhouse. Over the next week it was touch and go treating a variety of ailments. Tube feeding fluids, bottles off and on depending on what their systems could handle and when they would take them. Medications to help their immune systems fight against anything they were exposed to in that trailer. A lot of sleepless nights for Barbara. Barbara has a full time corporate job and has just a handful of regular volunteers, there is no staff. So when these sick lambs and kids come into the rescue, it is Barbara who creates an ICU for them in her home. It involves a lot of work, a lot of worry and waiting. Waiting to see if all of these efforts will be successful and they'll turn the corner. Turn the corner they did. Now, they're starting to play, starting to nibble on grass and are the best tail wagers you've ever seen. Unlike goats who often park their kids to go off and graze, lambs are always with their moms. These little lambs follow 2 legs instead of 4. You can't go anywhere on the farm without them being under your feet and just try going through a gate and leaving them on the other side. It's near impossible. It's all about "where's the milk?" Saving the littlest slaughterhouse rescues is not easy, the conditions are often more than they can overcome. Every once in awhile though our efforts triumph and we get to experience the joy that these babies bring....welcome to the rescue Bongo and Halle. You already have a fan club! Little Mia arrived at the rescue, just a few weeks old, in late February. Due to her very small size it was clear she wasn't destined to be an active part in any dairy herd. We knew she was a little "off" from the start. She didn't move around or play like the other kids and was slow to figure out the bottle feeding process. It was clear she wasn't a "normal" kid. A short time later we learned she had a heart murmur, one that she is highly unlikely to outgrow. It was pretty much determined then that she was likely to become a permanent rescue resident. Now 5 months old she still moves slower than the other kids, her back legs are a bit stiff and she has remained the smallest kid on the farm. The newborn kids usually surpass her in size in just a few weeks. But she's a happy little goat. She grazes more than any goat on the farm, she's recently discovered a love for the leaves she finds along the road outside the farm gate. We've walked that road for countless hours ever since. And you will often find her standing at your feet staring at you, waiting for you to pick her up. Mia loves to be held. So much so that I mentioned I needed a sling to carry her around in as I was far less productive with a goat in my arms and could never resist her pleas to be scooped up. Volunteer Jerrinne just happened to have a "ring sling" she no longer used and donated for Mia. It instantly became Mia's favorite place. Jerrinne and Mia in the "ring sling"